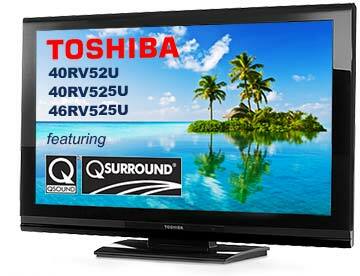 Included in Toshiba’s recently announced full 2009 line-up of LCD televisions are the RV52 and RV525 series featuring audio enhancement with QSound’s QSurround® and QXpander® technologies. Available in 40-inch or 46-inch screen sizes, these popular entry-level series of 1080p full HD televisions offer consumers impressive image and sound quality at attractive price points and have already proven to be among Toshiba’s most successful HDTV lines since first being introduced with QSound audio enhancement in the fall of 2008. QSound’s QSurround and QXpander sound enhancement technologies bring rich, immersive audio to Toshiba’s RV52 and RV525 series LCD TVs, making TV entertainment come alive with new sonic dimensions. QSurround proprietary algorithms render high-quality, multi-channel virtual surround audio with maximum spatial impact over stereo speakers and multi-speaker surround systems, creating a powerfully immersive listening experience. For conventional two-channel speaker output, the QSurround process creates a phantom center channel, enhances front-channel reproduction, and creates virtual surround speakers to render all channels in their correct positions. The expansive sound field created by the QSurround virtual speakers is nothing less than stunning. 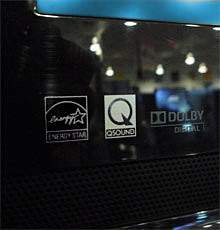 Also included in Toshiba's RV52 and RV525 LCD TVs is QSound’s QXpander stereo enhancement algorithm, providing for multi-format audio enhancement capability. QXpander’s patented, stereo soundstage expansion algorithm uses ordinary stereo input signals to produce left and right channel output signals with dramatically widened stereo imaging, adding depth in three dimensions for enhanced audio realism. In addition to QSound audio enhancements, RV525 series LCD models are loaded with several other advanced features that make for compelling TV watching and gaming. Toshiba’s DynaLight™ Dynamic Back-Light Control monitors brightness levels and adjusts the backlight accordingly for rich, deep blacks. With the ability to reproduce more than 68 million colors, these LCD TVs deliver exceptionally vibrant, true-to-life image quality. Three-HDMI inputs, two ColorStream® HD inputs, as well as S-Video and high res PC inputs satisfy diverse media connectivity needs. Plus, an innovative Gaming Mode allows for fast controller to screen response time, while Native Mode™ eliminates unnecessary over-scanning and restores picture size. Toshiba's RV52 and RV525U LCD TVs are currently available in North America from major electronics retailers. For more information, please visit the Toshiba website.